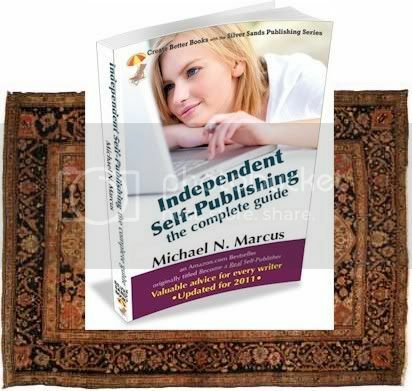 Book Making: Why is my book like a tapestry, rug or quilt? My newest book went on sale about three months later than planned. It went through hundreds of on-screen revisions, and at least a dozen printed proofs before I pronounced it "good enough" to be sold. I said "good enough," not "perfect." I know it has three small errors that few people (or maybe no people) will notice. I also know that it has fewer errors than most books I've read -- even books put out by the big traditional publishers with huge staffs of editors, proofreaders and fact checkers. I learned the hard way that each time I make a correction, there is a good chance that I will introduce other errors. They'll need to be corrected, and their corrections may lead to more errors, and the cycle never ends. Perfection is elusive, and perfection may even be dangerous. In Greek-Roman mythology, Arachne was a skilled human weaver who braqgged that she was a better weaver than Minerva. Minerva was the Roman equivalent of the Greek Athena and was goddess of weaving (and of other things, and the inventor of music). Arachne refused to acknowledge that her skill came from Minerva. 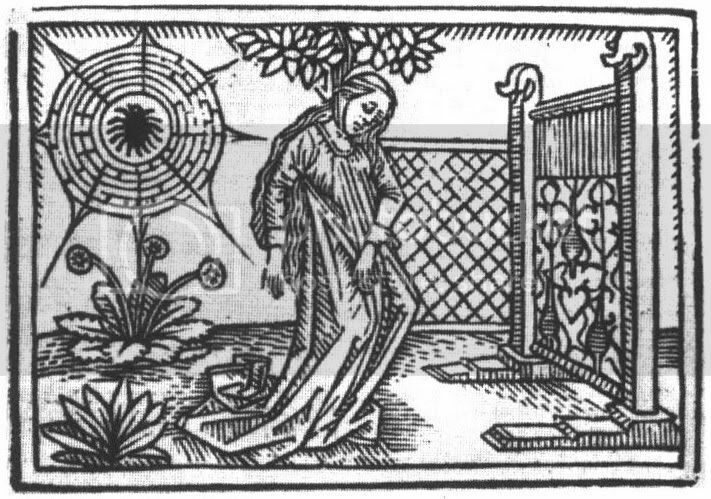 According to Ovid, the goddess was so envious of the magnificent woman-made tapestry, that she destroyed the tapestry and loom, slashed Arachne's face and turned Arachne into a spider. In biology, "Arachnids" are the group of critters that includes spiders. Cathy Thomas, also known as Cat, blogs about quilts. Cat wrote, "A humility block is a quilt block with a mistake in it. Either the quilter didn’t notice the mistake until after the quilt top was assembled, or she intentionally left the mistake in the block, not wanting to take the time and effort to correct it. Over time, some superstitions arose about these blocks. One story says that the humility block must always appear at the lower right corner of the quilt. Another story says if a bride makes a perfect quilt, her marriage will be unhappy. . . . I have heard that Amish quilters intentionally make a mistake in their quilts because only God is perfect and making a perfect quilt is prideful. This is the classic example I use when justifying a piecing mistake in one of my quilts. However, when I researched the subject of humility blocks, I was surprised to learn that this information is a myth rather than a fact. Quilt historians, who have asked Amish quilt makers about the humility block, write that these women are shocked by such a suggestion. To the Amish, having to make a mistake on purpose suggests that their work is already perfect, which is prideful in and of itself . It’s like saying, “I’m so good at quilting that unless I mess up on purpose, I am perfect.” Obviously, there’s no humility in that! An anonymous blogger wrote, "This quilter's decision to put a deliberate mistake into her work unites her with countless other artisans from around the world. The makers of those meticulous Persian carpets made obvious errors in their rugs to show that no one was perfect except Allah. Some people believe that the Gods might be angry about arrogance of a human effort to produce a work of art without imperfection. Navajos thought evil spirits could escape only through an error in art. So, I'll live with a few mistakes -- at least until it's time for a major revision. I wouldn't want to be turned into a spider, or a bookworm. Rug photo from http://www.willishenry.com/. I'm not sure of the origin of the Arachne illustration.